If you are looking for meaningful analysis of why we call grandparents the names we do, don't look here. If you just want a sampling of grandmother names and grandfather names, along with some touching stories about grandparents and grandchildren, this book is just the ticket. Attractively designed and printed, it would be perfect as a gift to announce, "Guess what! You're going to be a grandparent!" 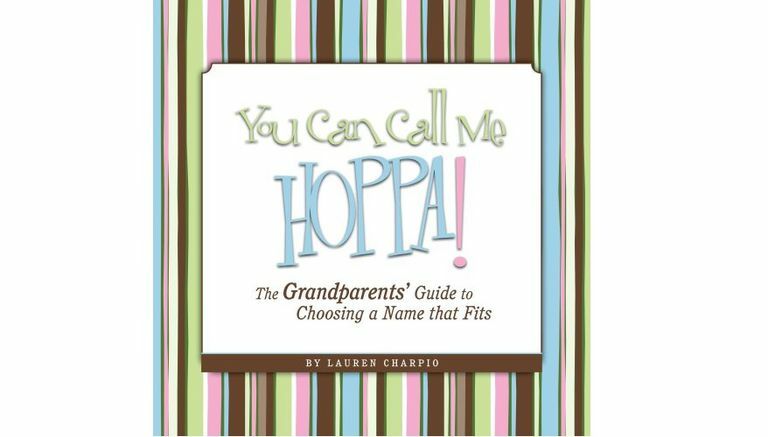 Any grandparent who has ever struggled with choosing a grandparent name will enjoy You Can Call Me Hoppa! by Lauren Charpio. The book contains around three hundred grandparent names divided into categories such as "Traditional Titles," "Cultural Appellations" and "Perfectly Personal." The main message is that grandparents should not feel restricted when choosing a grandparent name, but should instead feel free to choose or develop a name that is uniquely their own. For example, one surfer grandfather opted for "Grand-dude." Of course, grandchildren sometimes have something to say about what they will call their grandparents. One grandfather who had decided to be called "Pop Pop" ended up being called "BopBop," won over in part by the cute little dance his granddaughter would do when she said it. "The cutest part was when she said BopBop, she would bend her knees and do this little bounce-like dance. How could I resist?" One section deals with the names traditionally used by different cultures and nationalities. From the Hawaiian "Tutu-wahini" for a grandfather to the German "Grossmutter" for a grandmother, this section is rich in possibilities for those connected, however tenuously, to a particular culture. One new grandmother who used to be a French teacher chose the French term "Memere" just because she was such a fan of the language. I also appreciated the design of this grandparent name book. It avoids the overly cutesy, cluttered pages of lots of books designed for grandparents. As the book itself projects, all grandparents are not the same. Some of us are more loft than a cottage, more minimalist than kitschy. Also, the book looks and feels well-made and substantial. Besides being appropriate for parents to give to grandparents-to-be, the book would also be a great gift for a grandmother shower. One more cool thing about this book is that a portion of the sales will go to the Southwest Autism Research and Resource Center, based in Phoenix. As the author points out, the fondest dream of many parents and grandparents of autistic children is to hear their name spoken by their child.